NOT ALL DOGS CAN SWIM!! Confidence in the water comes before good swimming! Lets teach your dog to love the water- after all we do live in the desert!! 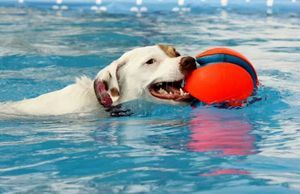 Once a dog is comfortable swimming, Water Sports can be introduced! This can include Dock Diving, Speed Retrieving, Paddleboarding, Kayaking, and more!